WASHINGTON — The U.S. unemployment rate fell to 3.7 percent in September — the lowest level since December 1969 — signaling how the longest streak of hiring on record has put millions of Americans back to work. 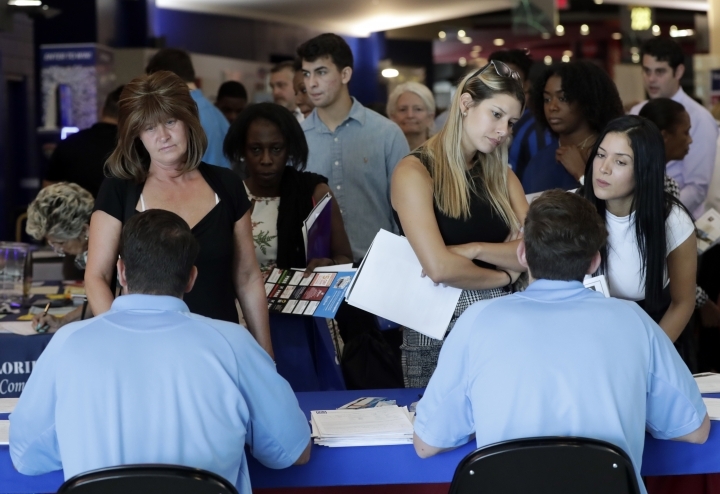 Employers added just 134,000 jobs last month, the fewest in a year, the Labor Department said Friday. But that figure was likely depressed by the impact of Hurricane Florence. That storm struck North and South Carolina in mid-September and closed thousands of businesses. A category that includes restaurants, hotels and casinos lost jobs for the first time since last September, when Hurricane Harvey exerted a similar effect. In recent months, though, healthy consumer and business spending has been fueling brisk economic growth and emboldening employers to continue hiring. Americans are confident about the economic outlook, buoyed by the job gains and signs of higher pay. The September gain extended an 8½-year streak of monthly job growth. What's more, the government on Friday revised sharply up its estimate of hiring for July and August by 87,000 jobs. So far this year, monthly job growth has averaged 208,000, up from a pace of 182,000 for all of last year. "The acceleration in job gains this year is extraordinary in an environment where firms are having great difficulty finding qualified candidates," said Stephen Stanley, chief economist at Amherst Pierpont Securities. Average hourly pay rose 2.8 percent from a year earlier, a moderate gain and one tick below the year-over-year increase in August. Many economists expect pay growth to accelerate in coming months. With unemployment so low, companies are facing intense pressure to raise pay to land workers. Amazon responded this week by raising its minimum wage to $15 an hour. Financial markets were down sharply in late-morning trading. Investors have grown concerned about higher interest rates and the impact they might have on the economy and the stock market. Friday's jobs report will likely keep the Federal Reserve on track to raise short-term interest rates, economists said, with another rate hike expected at its meeting in December. The Fed's hikes might be starting to bite. Borrowing costs for businesses and consumers are rising. Pointing to the economy's health, the Fed last week raised its benchmark short-term rate and predicted that it would continue to tighten credit into 2020 to manage growth and inflation. Over time, higher borrowing costs make auto loans, mortgages and corporate debt more expensive and can eventually slow the economy. Anticipating stronger growth — and perhaps higher inflation — investors have dumped bonds and forced up their yields. The yield on the government's 10-year Treasury note, a benchmark for mortgages and other loans, has touched its highest level in seven years. For now, consumers, business executives and most economists remain optimistic. Measures of consumer confidence are at or near their highest levels in 18 years. Retailers have begun scrambling to hire enough workers for what's expected to be a robust holiday shopping season. A survey of service-sector firms this week, including banks, hotels and health care providers, found that they are expanding at their fastest pace in a decade. Americans have continued spending steadily and appear to be in generally stable financial shape. Households are saving nearly 7 percent of their incomes — more than twice the savings rate before the recession. That trend suggests that a brighter economic outlook hasn't caused consumers to recklessly build up unsustainable debt. President Donald Trump's trade fights could also weigh on the economy, though the effect on hiring won't likely be felt until next year, economists say. The Trump administration has imposed tariffs on imported steel and aluminum as well as on roughly half of China's imports to the United Sates. Most U.S. businesses will try to absorb the higher costs themselves, at least for now, economists say, and avoid layoffs. Still, should the tariffs remain fully in effect a year from now, roughly 300,000 jobs could be lost by then, according to estimates by Mark Zandi, chief economist at Moody's Analytics. Manufacturers, which are more dependent on foreign markets than other industries, added 18,000 jobs last month, a sign that the trade fight so far is having little effect on hiring.